March break is almost upon us! Have you decided what you’ll do as a family with the kids home from school for five days? No? Read on for some last-minute ideas for fun activities for everyone this week, no matter what your interests! A rural tradition in several Canadian provinces, an early spring visit to the sugar bush is a tried-and-true way to make sure everyone has fun this week! The good news is that you don’t have to be a rural Canadian to enjoy everything that the maple farm has to offer. Even if you live in the big city, maple syrup production facilities exist across Ontario, meaning that you’re never too far of a drive away. Did you know that maple syrup has been processed in almost the same way since colonial times? Or that the different colours and flavours of syrup are related to the amount of time spent processing the sap? There’s more to learn than you might have imagined about this stereotypically Canadian substance, and what better place to do it than at the place where it’s all made? A hike or walk through the maples is usually available as part of a sugar bush tour, either self-guided or with a guide, and nature lovers will enjoy the fresh air, while history buffs will love to see the old-fashioned tree taps contrasted with more modern sap-collecting technologies. Family members with a sweet tooth will enjoy the smell of sap boiling and hearing about the different culinary applications of maple syrup, as well. Who knew it wasn’t just for pancakes and waffles? Many sugar bush tours end with a visit to the gift shop, where you’ll find maple candy, maple fudge, maple sugar, and – oh yeah – syrup! Some businesses even offer a hot breakfast with coffee, eggs, bacon, and even pancakes with more syrup. What more could you want after a hike through the woods? This is an activity to that’s best to try early in the day, so that everyone can work off the sugar before bedtime! A trip to the science museum is a great way for everyone to get excited about learning! Whether it’s a physics lesson through the lens of an electric ball that makes your hair stand on end, or an exhibition on various fire-powered technologies, there’s sure to be something excitingly educational that your family will love. Before you head to the museum, spend some time as a family to find out what’s happening and what exhibits you’d like to visit. Maybe each family member can choose an exhibit, and do a bit of research to find out more about their topic. For example, if one child is really excited about visiting the space exhibit, they can learn three fun facts about outer space to share with the family on the way to the museum, to help everyone else get as excited as they are for “their” exhibit! This will help everyone work together to support each other’s likes and wants once you get there. Science museums can often feel more like an amusement park than an educational facility, and there really is an effort to make everything feel extra fun and enticing. This is an opportunity to remind kids that learning is exciting and fun, and that every day is an opportunity to learn something new. A great way to reinforce that message is to try and find inspiration for a science experiment to try at home after your visit! Did your child love learning about dinosaurs? Maybe a 3D dinosaur puzzle is a great way to encourage that interest. If they really enjoyed learning about different weather patterns and what causes storms in the atmosphere, a classic “tornado in a bottle” experiment is a good opportunity for them to explore the science behind extreme weather with items you probably already have around the house! Looking for a way to spend a day together at home, or an activity to keep everyone working together on a wet or extra-cold day? Get creative with an indoor scavenger hunt! Hide a prize somewhere in the house and work on creating clues that, one by one, lead your family to the hidden treasure. You can use a theme to guide you or simply go with the flow, but a great way to get started is to come up with a special toy or treat that your kids can share, and hide it in your house. Then, write clues backwards from the last one. So, if the prize is hidden under the couch, start with the last clue that leads them to the couch, Then, write a clue that leads them to the coffee table, where they find the clue that sends them to the couch. And so on! Not only is this a fun activity that will get your family excited about the idea of a cool prize, but it will encourage family members to work together to understand each riddle or clue, and it will also stimulate critical thinking and problem-solving skills! This is one activity that even older kids and, yes parents, can really get into and enjoy. Some great ideas for scavenger hunt themes include an archaeological dig, or pirates with a treasure map. If your daughter loves hockey, the clues could all be related to famous hockey players, or if your son is really into science, maybe they’re clues from the last chemistry unit they studied at school. Whatever makes your children happy is a great place to start when thinking about ways to create a magical and fun day at home that they’ll remember for years to come. It’s early spring and everyone’s excited to start seeing greenery again. But we’re still a few weeks away from leaves on the trees and flowers in bloom. The solution? A visit to your local botanical gardens! Parents can enjoy a walk around the outdoor gardens, where you’ll find examples of native species and vegetables gardens. While many flowers may not yet be in bloom, these gardens are typically very well laid out and have interesting architecture, sculpture, or other artwork incorporated. If your town has an indoor botanical garden or greenhouse, it can be fun for everyone to wander around and look at tropical plant species that aren’t often found in Canada and learning about ecology, all while enjoying warmth and humidity that you miss during the winter. Some botanical garden gift shops even have seeds, bulbs, or seedlings that you can take home and try out. Houseplant care is a great way to teach kids about responsibility, the importance of scheduling with a water schedule, and even patience! Just make sure to double check that you’re choosing a non-toxic plant if you have any pets, or kids who might be curious about trying to take a bit out of the leaves! Some botanical gardens are also paired with a bug museum or a butterfly conservatory, and what a great way for kids to have fun with some biology! Between life cycles of bugs and the beautiful colours that they see on butterfly wings, this is an activity that younger kids especially are sure to enjoy. Escape rooms have been rapidly gaining popularity with adults over the last few years, but there are also plenty of businesses that offer kid-friendly themes! Whether it’s a carnival or a mystery, these child-centered escape rooms provide a great backdrop for your family to get excited about working together towards a common goal – escape! Escape room participants work through riddles and clues together to make decisions about what actions to take next. There are several challenges and puzzles involved in each room, so this is a great chance for your kids to put on their thinking caps. Older siblings and parents can help guide the group if younger ones feel a bit overwhelmed without direction, and everyone can work together or individually solving riddles. All of this teamwork under semi-stressful situations and racing against the clock will give your family a sense of accomplishment over having worked together to get out, or to have come close! But what if the team fails, and you don’t escape in time? It’s a great opportunity to teach about failing with grace, and to talk about how we can learn from mistakes and to improve for next time. Maybe some family members spent a bit of time arguing about the correct answer to a particular riddle – there’s room for improved teamwork and patience there. Whatever the outcome, it’s a great way to bond and sure to be a memorable day spent together! 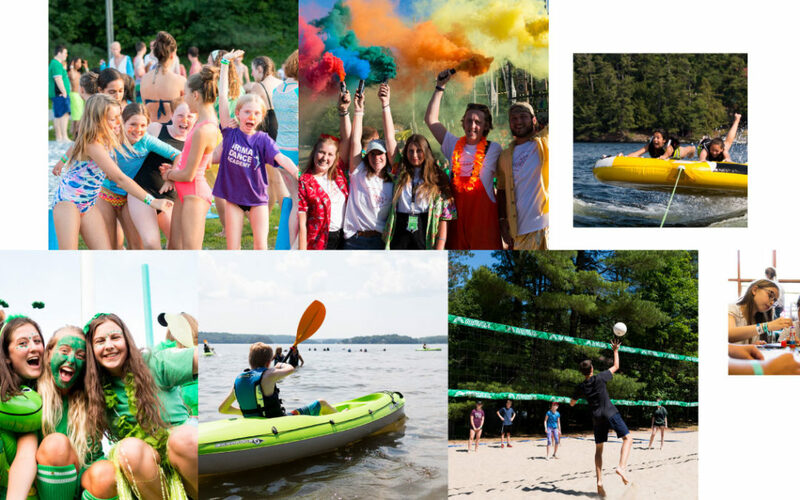 A summer camp so excellent, you’ll want to come.